Outside it is raining. On the television Anzac commemorations from around the country have been demonstrating that even with rain, people still want to remember our past servicemen and military events. But it is the physical elements of our Anzac day celebrations that have set me thinking…and an article in our local paper, the Waihi Leader. And then I thought I would share them in an act of remembrance. In the Waihi Leader, Kit Wilson and Sue Baker Wilson, well known local heritage advocates and researchers, wrote that the naming of Anzac Bay, at Bowentown, Bay of Plenty occurred on November 11 1915; some 7 months after the first landing by Anzac forces at Gallipoli, and almost 2 months prior to the end of the campaign. One of the earliest commemoration sites in the country. ‘commemoration of our heroic boys and their fellow soldiers who so gallantly effected a landing at Anzac Bay in Gallipoli’. The recent Waihi Leader article also states that Anzac Bay, Bowentown or Otawhiwhi is the only ‘place’ on mainland New Zealand to hold this name (there is one other on Waiheke Island, Auckland). I find this very interesting that in all of New Zealand, this is one of only 2 geographic locations or ‘places’ named to commemorate the Anzacs directly. On the face of this fact alone Anzac Bay could be regarded as a nationally important site. Meshed with current guidelines and assessment criteria associated with heritage and archaeological site conservation, preservation and management, Anzac Bay should be seen as a site demonstrating significant cultural and social values, and important to New Zealander as a whole. Looking north from Te Kura a Maia Pa along Anzac Bay. But, it seems few know the facts. And without people knowing what an interesting place this is, it cannot really be classed as significant, or particularly important. Can it? Archaeologically, it is well documented that this is a fascinating area with evidence of Maori use and occupation from the earliest periods. There are pa sites, namely Te Hoa and Te Kura a Maia, there are middens visible and early ‘archaeologists’ found evidence of stone tool workshops, settlements (kainga) and hearths. The Katikati Heads at which Anzac Bay sits also marks the northern boundary of the Mataatua confederation of tribes. It is an important landmark in the early European settlement of the area, with the first recorded in 1875. At the time the Bay and Heads were called Katikati. I have seen differing accounts as to why. Some say the first Europeans called the Bay Katikati, and others including Hank Hanlon, a biographer of the Waihi Beach area, states that the name Katikati means, ‘the rat has chewed it’. Referring to a Maori legend involving Rangitoto, a young chief from Paeoroa and Pareaute, of Matakana Island and a battle between their iwi. Post 1875, the Bay quickly became a trading point with a supplies depot and shop established. British troops were stationed in the Bay during land troubles with Bay of Plenty iwi. In the book ‘My Simple Life’ by Adela Stewart, she mentions a post office, telegraph station, houses and Maori whare in the Bay. The name of the area was also changed to Bowentown, after an early governor of New Zealand, Sir George Bowen, who is thought to have camped in the Bay c. 1869. 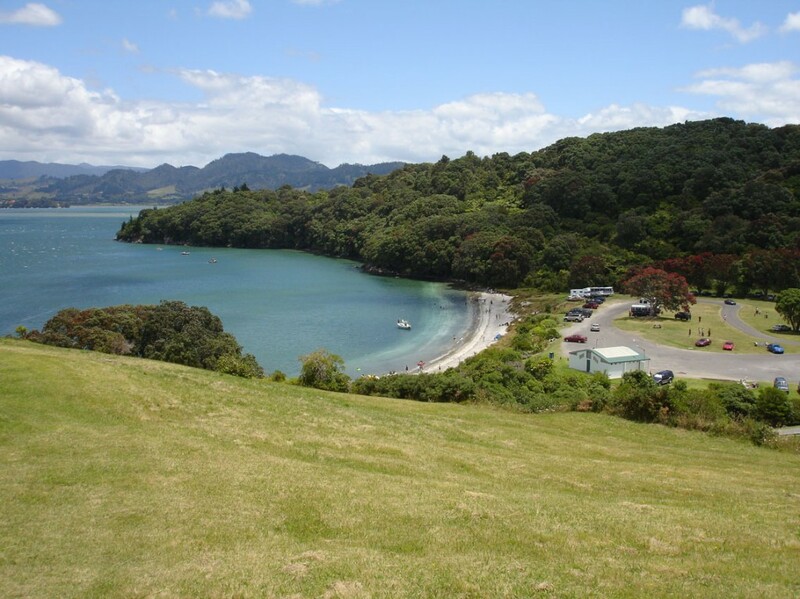 Anzac Bay is also intrinsically linked with the gold mining history of New Zealand. In the early 1900’s retired miners moved into the Bay, as squatters. A number of houses, structures and basic roads evolved. There were approximately 30 properties at Anzac Bay, including my Uncle Lyle’s. There was a hall, and access was either by sea from the harbour side, or down Waihi Beach at low tide. These inhabitants were moved on in 1957 when the modern road was put in. One can only assume these miners may also have been motivators for the change of name to Anzac Bay, given many were living at the Bay in 1915. The legacy of this small community is an array of garden plants that still cling to the small bank down to the beach. Anzac Bay has been a very busy Bay. But I had not considered that its current name was rare in New Zealand, particularly given our national commitment to the celebration of Anzac Day. Names are often a good indicator of origin, affiliation or allegiance in the archaeological record, of many cultures. They can aid understanding of political, economic and social movement and interaction. When names are found in association with artefacts, monuments or structures it further aids our understanding of people, places and events. The discovery and understanding of coins, or numismatics, is an example of this. The changing of the name St Georges Bay to Anzac Bay, is a clear reflection of this. Given that the Bay was predominantly populated at the time of the name change with ex miners, many of whom went to war in this area following the demise in mining and the 1912 Waihi Strike; it is likely that this conflict, had a big impact on their lives. But the importance of a name is nothing but an abstract title, unless it has significance and relevance to communities, be they local or national. Cenotaphs have traditionally acted as focal points for ceremony and ritual around the world during Anzac Day services. By their monumental nature they have a strength and visibility that embraces physical acts of remembrance, such as the laying of wreaths and individual poppies. The shape of a cenotaph is generally the same the world over; grey, concrete and meant to represent a tomb or burial casket. A point of focus in New Zealand is the Auckland War Memorial Museum which holds its name because one of its original intentions was to act as a memorial to those that fell in World War I. Erected in 1929 from subscriptions to commemorate the third of all service men that died during the war and who remain on Europe’s battlefields, the 3rd floor is dedicated to New Zealand’s contributions to world conflict with 2 halls of memory listing the names of the dead with displays, exhibitions and information areas. Outside, the Museum’s cenotaph is the focal point for dawn ceremonies. Most cities or towns in New Zealand, how ever large or small, have a cenotaph or monument to act as the focal point or Anzac Day commemorations. There are currently 453 civic WWI memorials recorded in New Zealand. The Tinui Memorial Cross, near Masterton in the Wairarapa has recently been recognised by the New Zealand Historic Places Trust as the site of the first Anzac Day commemoration on April 25 1916. As one of New Zealand’s earliest memorials to the Anzacs it was erected 1 year after the Gallipoli Campaign began. Cemeteries sometimes act as the point of focus, with areas reserved for returned servicemen. These act as a very visible reminder of people lost to war and conflict, and create a place of year round remembrance, particularly for families and descendants. Geographical Locations such as Anzac Bay, as a point of focus, are not the norm. Depending on the cultural climate or political landscape of the time, this could be considered the greatest honour given to a place, landscape or setting. By re-naming a place, suggests beyond measure the impact of the subject it is renamed with, at least to that community. Anzac Bay in the Bay of Plenty is multi-faceted place in our landscape, set in a natural bowl, protected by headlands and hills, which flows out into a beautiful sheltered harbour. It is one of New Zealand’s earliest, perhaps largest, commemoration sites, with the capability to bring together many people into one place, as it already does each summer. Although it doesn’t now it could be used to remember and honour the people who have helped to protect our nation. It is a fantastic example of continuity of use, occupation and significance in the landscape. Dig beneath the surface and you are likely to find the evidence of the last c. 1000 years of our collective past; indigenous and colonial. Like the Anzac community, this Bay, represents the essence of bi-cultural New Zealand, which throughout history has seen people live and work side by side, with shared memories. Perhaps because of this Anzac Bay has more relevancies to modern New Zealand than it has done before. What a fantastic tribute to New Zealand. What a wonderful setting it would be to commemorate, remember and celebrate. 1915. Bay of Plenty Time, Thursday November 11, Local and General News Section. 1999 Hanlon, Hank. The Waihi Beach Story. Its Politics, Places and People. 2011 Wilson, Kit and Baker Wilson, Sue. The Katikati Advertiser. Bay’s Name Honours Dead. 2011 Waihi Leader, Anzac Bay article — accidentally thrown out in recycling prior to reference details recorded. Gallipoli is an extremely poignant place, and one that still captures the hearts of many Aussies and NZers. It is a pilgrimage for many. Archaeologically speaking there is now interest in the area to discover some of the lost stories of people like your grandfather which is a great thing. Just a tragedy that so many lives were lost so quickly. It is no wonder people felt the need or desire to commemorate the events in Anzac Cove and others in their own chosen homelands.